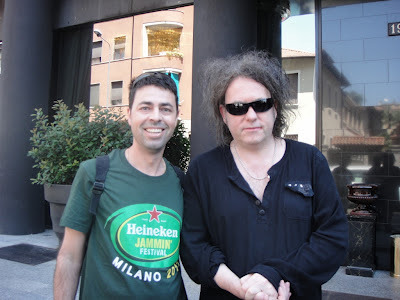 I was asked to wait until 2 weeks after publication to post this, and now that the time is up, here's the complete Word interview with Robert. Might still find a copy on newsstands, and also available on iPad. 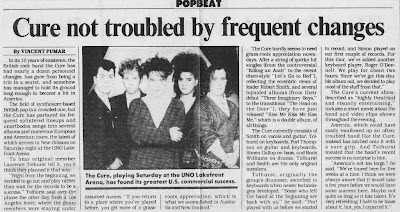 Robert Smith, Cure keyboard-player Roger O’Donnell and I are in a black van – the sort of multi-seat box soccer “moms” ferry their offspring around in – rolling down a motorway somewhere between Zurich and the small southern German town of Singen. It is early evening and the sun warms the lush green hills that surround us. Smith and I are having a beer while O’Donnell tells us about touring America with The Thompson Twins in support to The Police somewhere in the long-lost mid-’80s. We’re pulling up to a junction when Smith tells me how The Cure were playing in Moscow a week or so ago and everywhere they went there were posters for an upcoming show by Sting. “Unfortunately they’d written his name in Cyrillic script,” he says, chucking a peanut in his mouth. “And that’s how I know Sting in Russian is spelled C, U, M, T.” We laugh out loud and take another drink and let the light play on our sunglasses, and I think to myself, could there be any nicer way to spend Saturday evening? 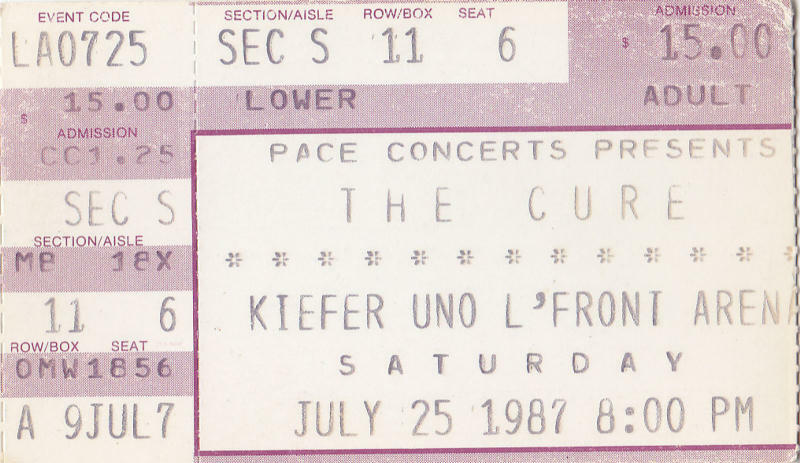 The Cure Special: Musik by Dj Knüpfi & DJ Wilco. 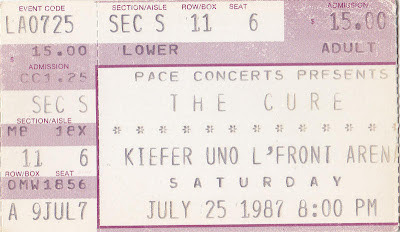 It was 25 years ago tonight that I saw The Cure live for the very first time. And for only $15! My seat wasn't the best, but not bad for buying tickets just 2 weeks before the show. Thanks to mom for buying it for me at the Maison Blanche in the Oakwood Mall. You can also vote for 'Boys Don't Cry' in the readers' poll. Update (July 25th, 2012): 'Boys Don't Cry' finished 6th in the reader's poll. Posted about this back on March 7th, but Tim Pope has brought it up again in the last few days, so worth mentioning again. And since he's posted it for free on Vimeo, I guess it's okay to link to the video now. 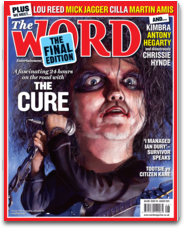 Also check out Tim's website for lots of other great Cure clips. And follow him on Twitter, too. 7 SummerCure shirts have been added to The Cure Store. Update (July 21st, 2012): Hungry Ghost & Lullaby t-shirts, along with a new badge set, have been added. From Roger on Twitter: "Very proud to have been a part of this amazing evening of music and now you can own the DVD! Quite a nice Moog solo!" Some more from this at France 3 (English). In this clip, Robert says he likes to record songs at home for himself and send the MP3s to Simon to get his take on them. So, yes, there will be new stuff eventually, but it doesn't matter to him when they do it. And in this clip, Robert says Mixed Up 2, with remixes by Mogwai (doing Faith), Cranes, and other favorite bands, will be out before Xmas, and Cure fans will love it. Another lie? Well, not the Mogwai Faith part. I asked Stuart (@plasmatron) about it, here's his answer - "we are going to. It’s not done yet though. Can’t wait!" 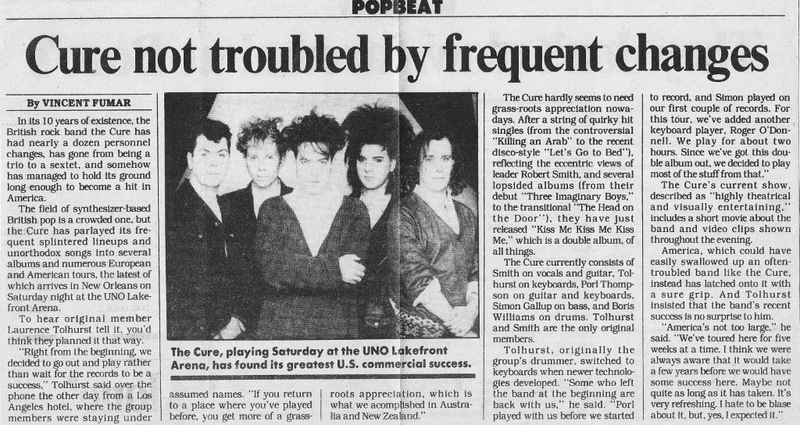 TMNews also has a bit of it and a report on the show, and again, the translator speaks over Robert. Giorgio with Jason at Rock in Roma on July 9th, 2012. 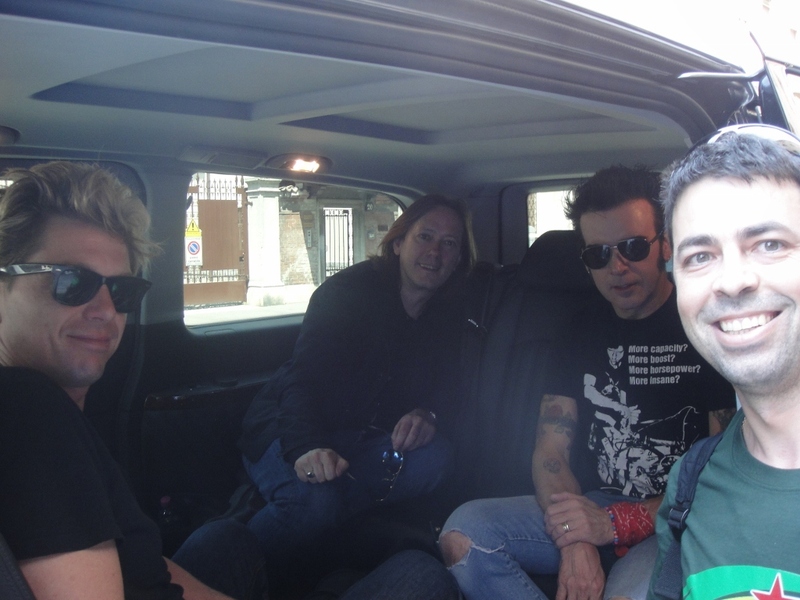 "The day after the show in Milan, after some sightseeing, i was getting back to the hotel to pack and fly to Rome, when i saw the band leaving the hotel. It was the same hotel i was in!!! And i did not notice aything different there before! So, i caught Robert, thanked him for the amazing concert and asked for a picture. After that, saw another van. Went there and there was the rest of the guys! 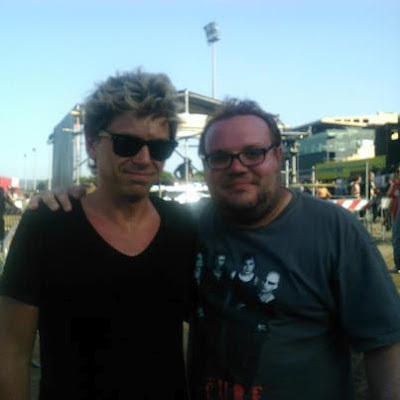 Thanked again for the concert, took a picture and told Simon i was from Brazil and was going to attend 4 concerts (Milan, Rome, Bilbao and Lisbon). He was so surprised! He even thanked me for what i was doing!!! !